These twelve sonatas are from an anonymous manuscript in the Kassel University Library. 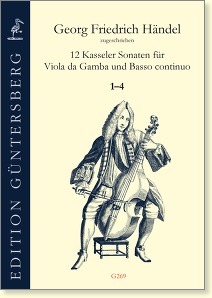 The title of the manuscript describes them as viola da gamba sonatas. However, they lie much too high for bass viol, so that specialists have long wondered how they could be played. In our edition, we now offer a solution: the viol part has been taken down an octave, and the two parts then transposed a third lower. As a result, viola da gamba players can now play these fine sonatas for the first time. In the year 2015, by means of handwriting comparisons, the Handel scholar Graham Pont came to the conclusion that the Kassel manuscript was scribed by William Babell, George Frideric Handel's main copyist. Pont is therefore convinced that the sonatas are the work of the young Handel. The music is catchy, varied, dance-like, well-structured, and has a lively bass that corresponds well to the melody part. In the year 2017 some evidence was discovered that the sonatas are possibly by Johann Jakob Kress. G266-G268: Six of the Kassel Sonatas have been found in a manuscript by Johann Jakob Kress. See details in G266 Addendum.